rif, Jeen and I went to Old Town Kopitiam in Hartamas last weekend to grab a bite. 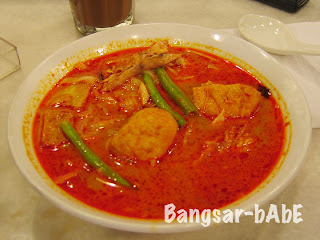 I ordered the Curry Kuay Teow (RM5.50). Had the yellow noodles replaced with kuay teow. I don’t really fancy yellow noodles as they have that weird chemical smell and taste. The curry broth was rich, mildly spicy and slightly sweet. It came with chicken slices, tau foo pok, long beans and of course, bean sprouts. Not bad, but I still prefer the Penang version. rif wasn’t hungry so he had the Butter & Kaya Toast (RM2) which he shared with me. 🙂 The thin slice of bread is toasted and sliced into half. 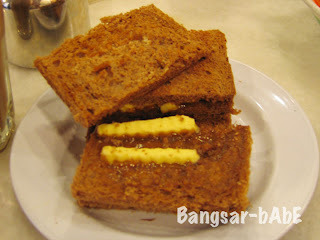 Kaya is spread on the toast and topped with butter slices. I prefer my bread to be thicker; slightly toasted on the outside and soft on the inside. This version made me feel as though I was eating biscuits. 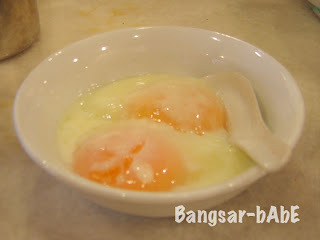 Jeen had the toast and Omega Soft Boiled Eggs (RM2). Don’t know how good they tasted. Have to ask Jeen that. The three of us had the Iced Old Town White Coffee (RM2.50). I thought this was mediocre as it didn’t have enough ‘kick’. 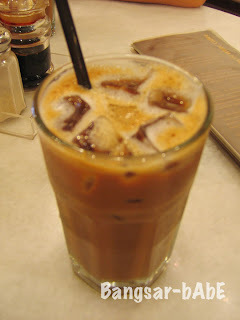 The best coffee I’ve tasted still has to be from Hai Peng Kopitiam in Kemaman, Terengganu. The damage came up to slightly over RM20 for the 3 of us. It wasn’t cheap since we didn’t order much. It is however a good place to hangout with friends if you get sick of mamaks.